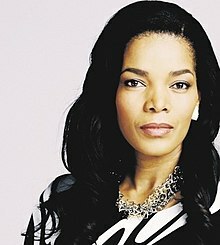 Connie Ferguson (née Masilo) is a Motswana actress, producer, businesswoman and model that was born in Lobatse, Botswana. She is popular for her role in South Africa’s most popular Soap Opera, Generations in 1994. She was born on the 10th of June 1970 in Kimberley, Northern Cape in South Africa. As of 2018, she is 48 years old. She is the daughter of Fish Masilo and Margaret Masilo. Her mother Margaret died in the year 2013. She is happily married to Aaron ‘Shona’ Ferguson and together they have two daughters, Lesedi and Alicia. The couple got married in November 2001 and renewed their wedding vows at a beautiful ceremony in 2011. The actress has two daughters who are Lesedi Ferguson and Alicia Angel Ferguson. She is also a grandmother to her eldest daughter’s (Lesedi) son. The boy is known by the name Ronewa. She starred in the M Net soap opera ‘The Wild’, as Marang Lebone, a helicopter-mom and the matriarch of the Lebone family that aired from 2011-2013. Connie has also played lead roles in ‘What If’, ‘Crime Reporter’, ‘Maitemogelo’ and ‘Soul City’ 1, 2, 3 and 4. She also had a lead role in the production ‘Cape of Good Hope’ and made a guest appearance on ‘Okavango’. Also in 2013, she was one of the celebrities who competed in the sixth season of a reality competition ‘Strictly Come Dancing’ that was aired on SABC 3. The popular actress has an estimated net worth of over $2 million. She earns an estimated salary of R75000 per month. In 1993, Connie was voted one of South Africa’s Ten Most Beautiful Women by Cosmopolitan Magazine and in 1997 she was featured in David Dodd’s Portraits of South Africa’s Most Beautiful Women.